I am of the opinion that you can never have too many backpacks. There are so many different situations that I use a backpack for, that I believe having a great variety is worth it. One of my most recent purchases was the REI Ruckpack. This backpack is perfect for short hikes, airline travel and camping. For me with most backpacks, the underlying decision of whether it will work or not is how my camera equipment will fit, and how easy it is to access. A backpack needs to be able to hold my gear, hold it safely, and still allow easy access. 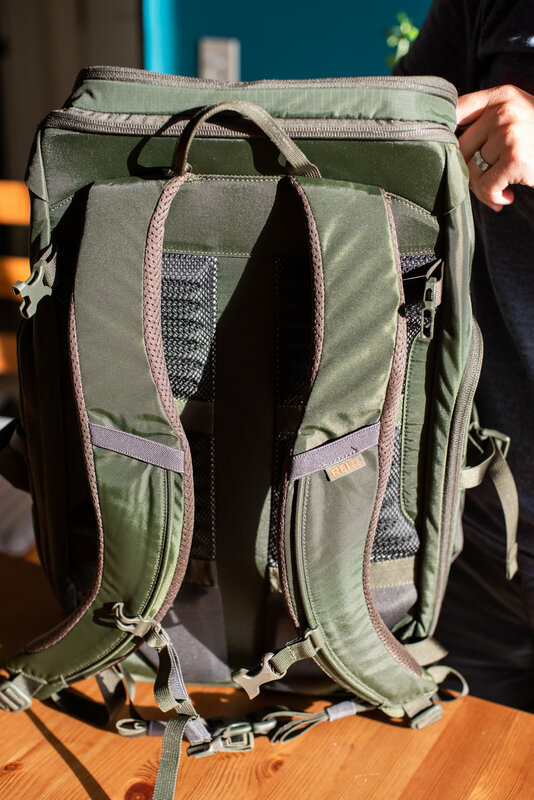 This backpack is perfect for my setup because it has a large top opening and is wide enough to fit my Timbuk2 Snoop which carries my DSLR and an extra lens or film SLR. The pack has space leftover for snacks, a book and a jacket, and more. 28L capacity. This is a great size, and it compresses fairly well to be a small bag, but can still fit a lot of stuff. It fits a hydration bladder with ports on both sides. The same compartment could also hold a laptop. A mesh back panel and well padded straps. Not the greatest suspension system, but comfortable for what I use it for. A nylon waist belt, which is removable. I don’t prefer these nylon belts, so I always try to remove them if possible. For a pack with this kind of simple suspension system, not meant to carry a lot of weight, the belt isn’t really needed. If you like to use these little belts, this pack has one! A stowable rain cover. Never know when that will come in handy! A large top pocket to stash smaller items you want easy access to. I like to put trail snacks up there, as well as a beanie and gloves when hiking in the cold. Two water bottle pockets with compression straps to keep items secure. One zips open to the inside of the bag to easily access the bottom half of the pack. One zips open to an accessory pouch to stash small items. Sometimes its easier to access the side of your pack than the top, so this is great for a wallet, and it is soft so you can secure your phone in there if needed. 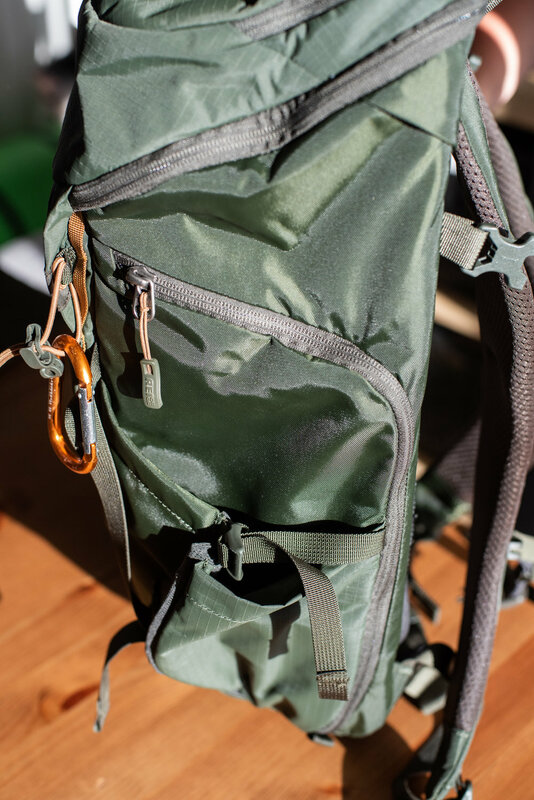 There are several lash points on the outside of the pack to attach trekking poles to, as well as any other items you might want to attach to the daisy chains hidden beneath a flap. The colors of this pack are amazing. While I chose the green, it also comes in black, blue, orange, or brown. I like all of them and they are all very sharp looking in person. Overall, I highly recommend this backpack. It doesn’t have a lot of small pockets, so most of the 28 liter capacity is in the main compartment and you can really load a good amount of stuff. I wouldn’t recommend it for anything too heavy, or for long hikes, because of the simple suspension system. It is a great travel pack for when outdoor activities combine with air travel. It’s also my go to car camping backpack to carry my personal items and camera for easy access at the campground, in the car, and any quick hikes that we venture out on.